This was our third Cumbria Way walk. The official third stage runs from Dungeon Ghyll to Keswick but we decided to split the walk and end this day at Rosthwaite. I am pleased we did. The day was a glorious, but the heat got the better of us, sapping our energy such that the walk felt twice as long as the miles we walked. The walk was originally planned for a weekend but a delay found us walking on a Monday and the differing bus times forced some logistical changes on us. We parked at a pay-and-display in Keswick, took the 555 to Grasmere, and a taxi to Old Dungeon Ghyll, having changed the taxi times often enough to tax the patience of our driver. Audrey repayed his good nature with a chat about sheep and cattle breeds, and a tip. 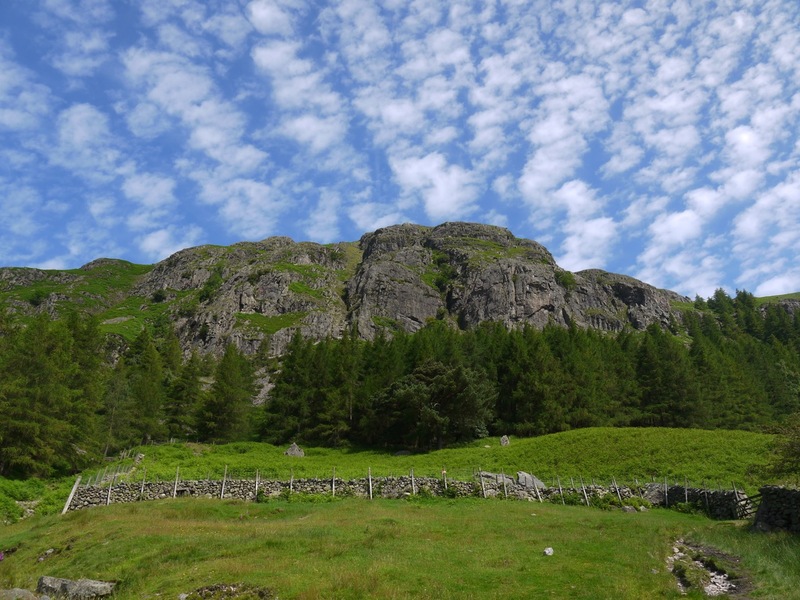 We arrived back at Old Dungeon Ghyll in much the same weather as the last visit, blue sky and warm still air. I had my new rucksack, an extra 11 litres capacity but still full with the same gear I usually carried in the smaller one. The waistband was tight at first but within a few minutes it needed tightening a few inches. The same thing happens with my trousers belt as well; I’m tempted to take a tape measure along and see how much my waistline changes when walking. Perhaps I stand up straighter when striding out or exertion redistributes my fat acutely. We headed up behind the pub and rejoined the Cumbria Way where we had previously left it just below the rocky outcrops of Raven Crag. From here we looked back into Great Langdale then turned west and set off past a wee sign informing us we were now in Mickleden, whose name means big valley. Mickle being an archaic word for large and den, a valley, sharing its origin with words such as dene. A rocky path runs between a tall stone dyke and the bracken and red sheep’s sorrel of the the hillside. Foxgloves, wild thyme and tormentil added spots of colour and the bog asphodel warned us that there was wet ground about. For scenery we had Crinkle Crags and Bowfell at first then as we turned fully into Mickleden Pike of Stickle came into view with its jutting summit and skirts of scree. As we came closer to the end of the valley the steep slopes of Rosset Pike gave little hint as to how we might climb out. The valley’s grey herdwicks and their black lambs stood about, occasionally lifting their heads from the grass to watch us pass. Closer to the valley’s end the path approaches Mickleden Beck which has small fairy pools with clear water flowing over multicoloured pebbles. By now the day had grown very warm, but we were still fresh. A walker ahead of us made it easier to gauge the distance ahead. A cairn marks where the paths to Stake Pass and Esk Hause diverge and though it looked quite close the walker’s size showed it to be further than it would otherwise have seemed. 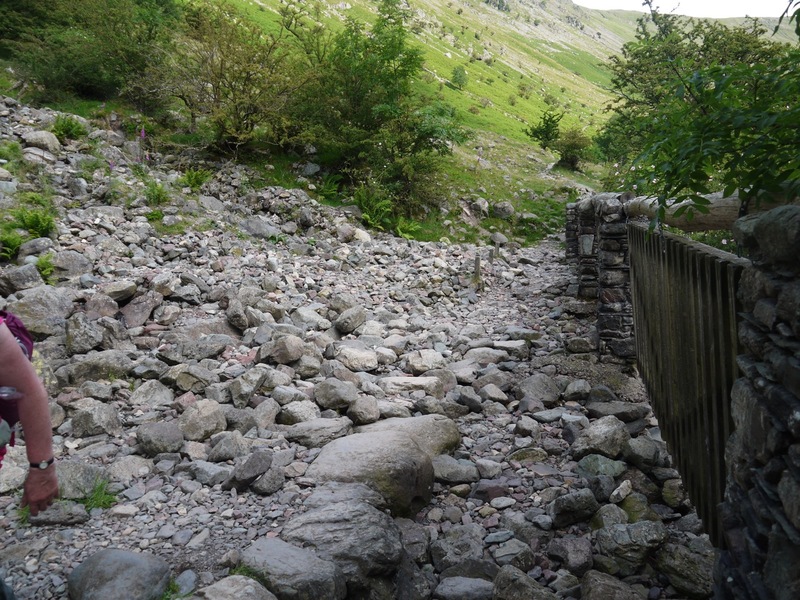 We crossed a wooden footbridge over Stake Gill, and rested on some flat boulders for a drink and some jelly babies before the effort of the climb up to Langdale Combe. The sheep were wise enough to rest in the shade from the walls of a sheep fold, whereas the humans sat in the sun. A couple of brown sheep watched as we headed up to Langdale Combe. (I have checked the photographs so I know I wasn’t seeing double). We took the climb slowly, zig-zagging with the path, but the heat, and the effort both of the climb and of taking notice of each footfall on the uneven rock steps, tired us quickly. I found myself picking a spot ahead then walking up that far and taking a rest. We didn’t fall further behind those ahead of us and weren’t overtaken from behind so I’m happy we kept a reasonable pace. 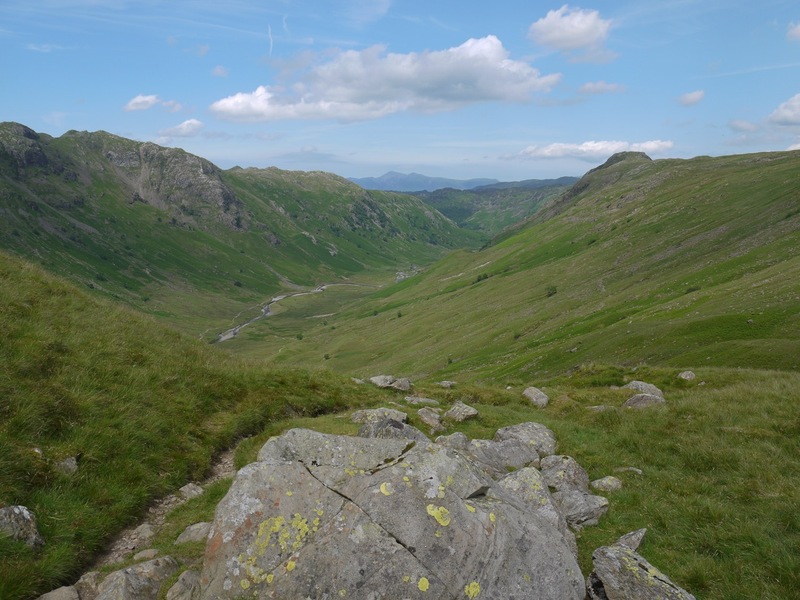 We could see a (false) horizon which marked the steeper climb from more gentle climb across Langdale Combe. We stopped for lunch and a rest, but I was feeling quite warm and decided to dangle my feet in Stake Gill to cool down. I left my boots where we sat and walked barefoot to the stream, my feet and ankles sinking into the warm water of the peat’s shallow pools. The gill’s clear water though was wonderfully chilled, there was tiny blue milkwort growing on the stream’s bank and mountain air was clean. Had there been a breeze it would have been an idyll. I had initially sat on a boulder by the gill, but then moved to sit on a grassy bank, only realising later that the ground was damp. I had a soggy bottom. I tried sitting on dry rocks to dry my behind but realised that I would just have to let evaporation do the job. In retrospect I think that this may have helped me shed some heat. Thank you, latent heat of vaporisation. After paddling I enjoyed my now warm sandwich and drank some of my still cool water. By then my feet had dried and the boots went back on. Rested and cooled we crossed Stake Gill, picking our way over a ford using natural stepping stones. 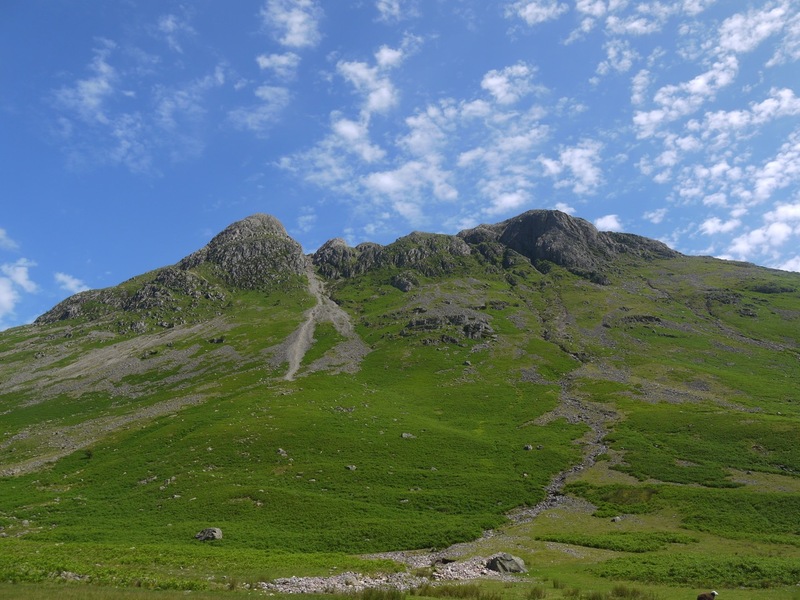 Langdale Combe is a hanging valley filled with post-glacial moraines. The ground was boggy in places and the path occasionally disappeared into boggy ground forcing us up to higher ground. Perhaps I should have carried my boots and walked barefoot through the bog? Crossing Langdale Combe took us across the watershed, leaving Stake Gill flowing away to the south and meeting Stake Gill its waters tumbling north over its waterfalls. 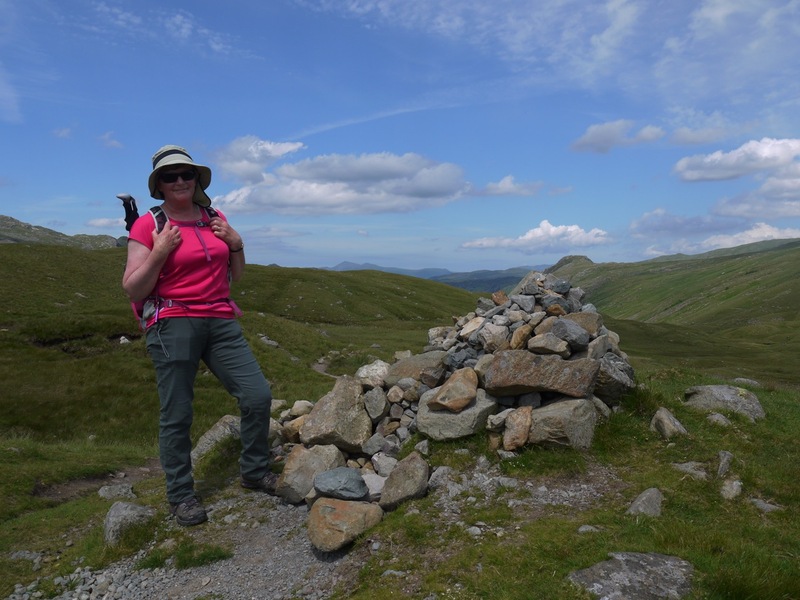 A cairn at the northern end of Stake pass marks a crossing of routes and also marked the end of our climbing for the day. We paused for photos at the highest point of the day’s walk and then took a short detour to an un-named tarn just above the path. I breathed a sigh of relief as we began our descent into Langstrath thinking end of the climb was the end of our effort. All that remained now was to stroll down to the valley floor then downstream to the end of the walk. 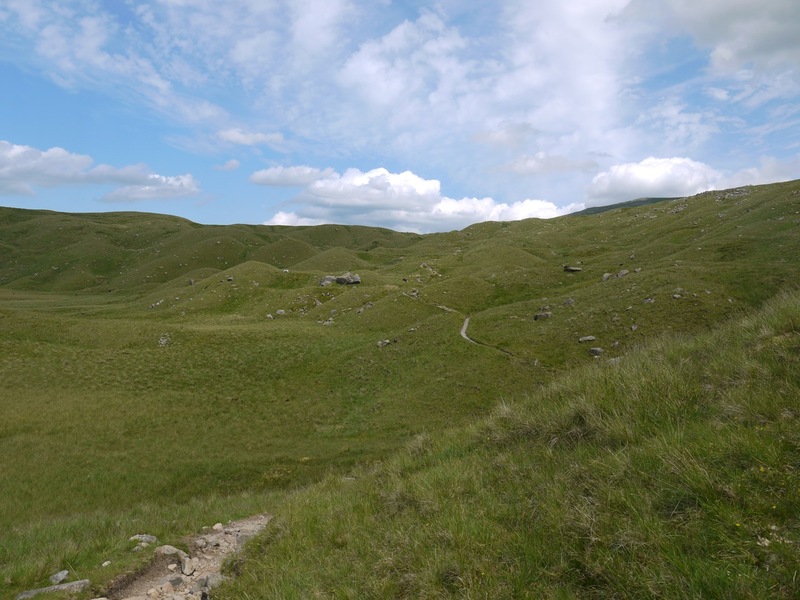 But Langstrath is literally the long valley, and the miles were country miles. The descent into Langstrath we had spectacular views of the valley in brilliant sunshine. But he who looks to the distance ignores his footfalls and the path was treacherous. The path winds down the hillside like a giant ribbon snaking from side to side to beat the gradient. 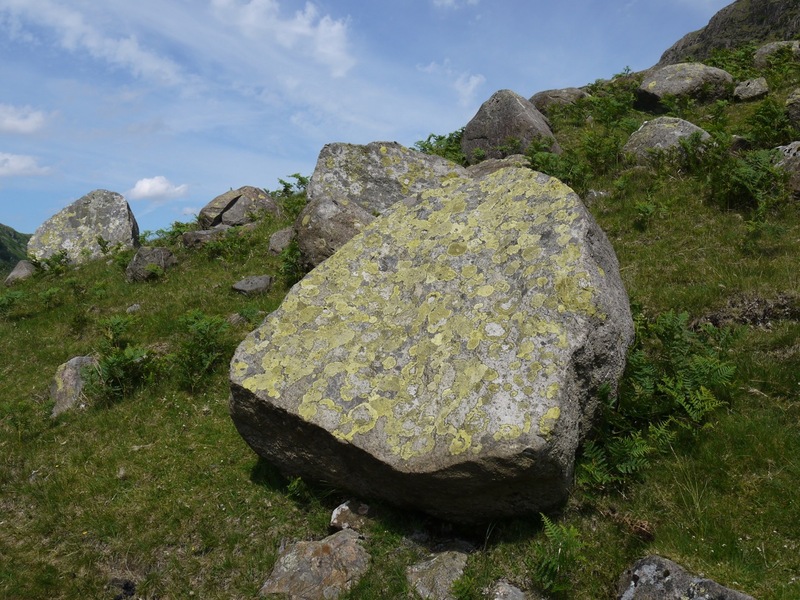 It seemed to have been topped with stones and pebbles so walking on it was akin to walking on scree. We both lost our footing several times despite walking with care, but both stayed upright. And despite this being descent I was exhausted by the effort. As soon as we crossed Stake Beck, on its footbridge, we paused to rest by an ancient Rowan. 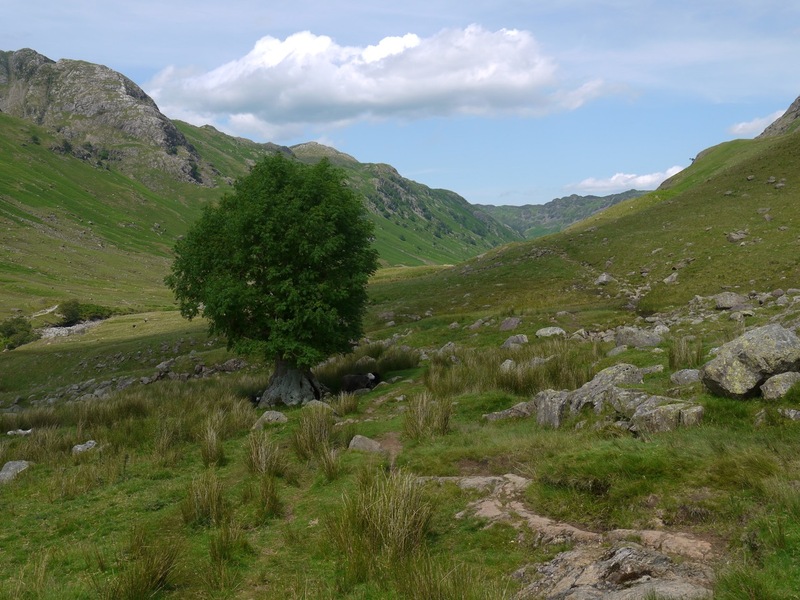 Judging by its circumference that tree has stood at the head of the Langstrath through the reigns of six monarchs, for decades before a man-made aeroplane crossed the sky above it, and may even have been gazed upon by eyes born in the eighteenth century. Humbled, we sat on a nearby boulder and watched the sheep resting in the shadow it had been provided for them and their ancestors all that time. Perhaps shepherds in older times sat on the same rocks, by what was then a wee sapling, and counted their sheep, “yan, tyan, tethera…”. The ancient rowan was the walk’s half way point, but the first half contained the main ascent and descent. The second half should have been easier and certainly we did not have to face any more climbing. I would love to say that we strolled easily drinking in the surroundings but we were beset by two challenges: the rocky uneven path and the temperature. I don’t know how hot it was but the following day was the hottest day recorded since 1976. 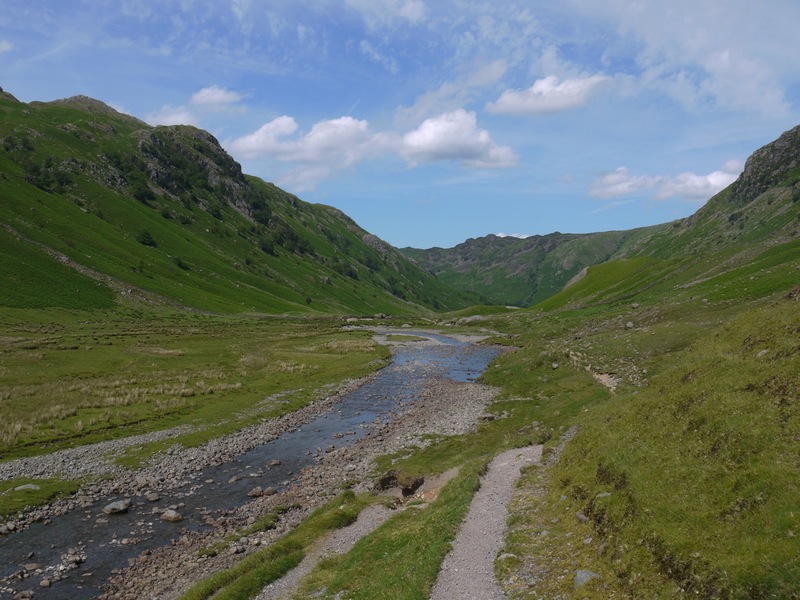 Back to 2017…we strode along the Langstrath joying the sun, the towering valley sides, boulders covered in lichen, (some still showing striations scraped by the glaciers), sheep, lambs and, hiding in the shade, several tiny carnivorous sundews. Several streams cross the path and were either dried up or easy to cross, but in wetter weather they might have been more of a problem. 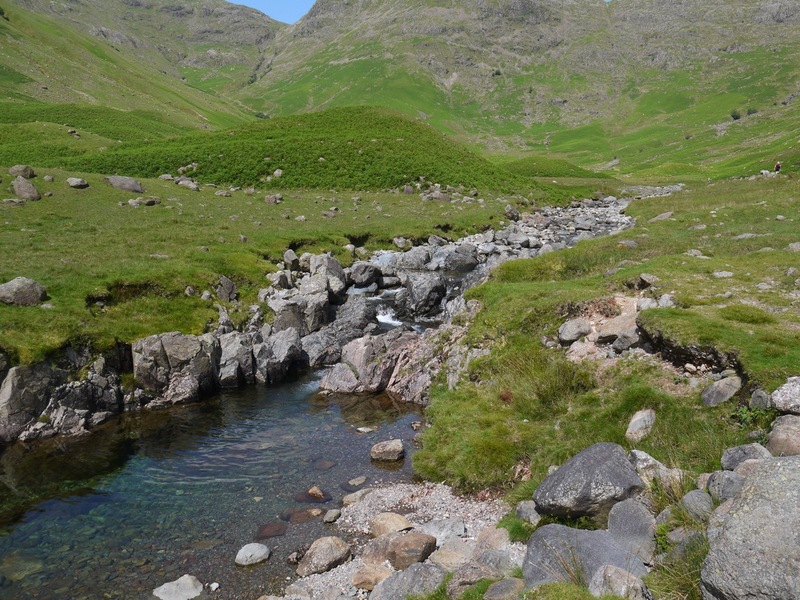 Langstrath Beck winds along the valley, perhaps a little less full than it can be, but at Blackmoss pot it enters a rocky ravine and stills to a deep pool. There were several youngsters there climbing the rocky ravine sides to dive into the cool water. 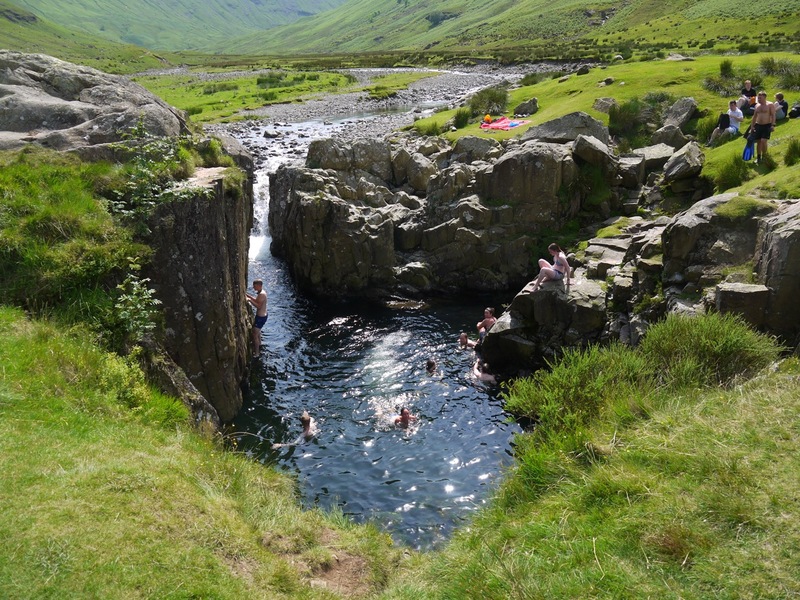 We left the swimmers to their pools and pressed on, but when we reached Greenup Gill the water was just too enticing and our bodies just too hot to walk past. So below the footbridge we stopped to cool in the water. In retrospect I think both of us were showing early signs of overheating so the rest and cooling were more than just for comfort. The bridge above our heads had a small plaque dedicating it to a young man who had died in the valley from exhaustion in 1939. A reminder that this beautiful and calm place of nature’s powers. 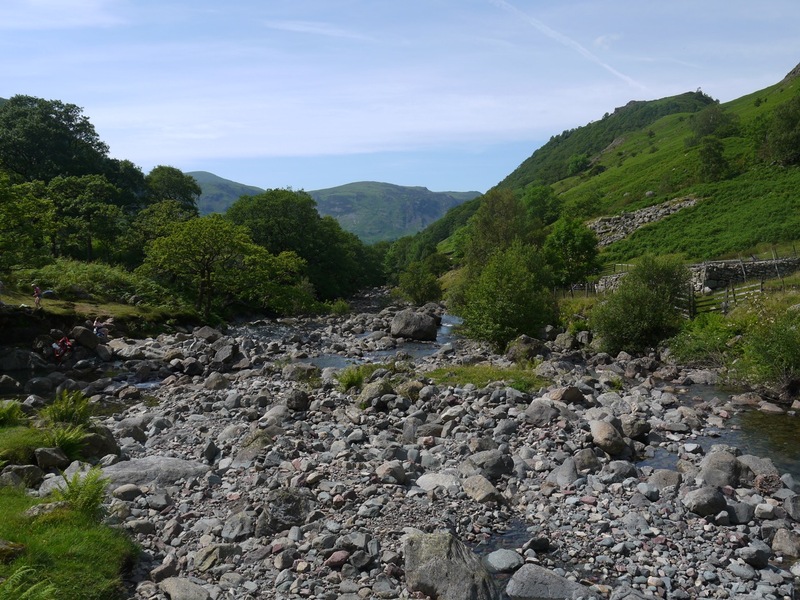 Cooled, and rested, we set off alongside Stonethwaite Beck, but now at least we were walking in woodland and I found myself wondering why the ancients worshipped the sun but seemed not to have sent their prayers to a god of the shade. (PS on reflection, I suppose the deity to thank would be the one controlling the trees). We continued to stumble over rocks never daring to mention when the path flattened out in case in made it become rocky again. I had slipped into trudge mode and found myself counting my paces to check we were walking at a reasonable pace. There was some question as to whether we should take a detour to Stonethwaite for a chilled drink or press on for Rosthwaite. The choice was uncertain until we reached the Stonethwaite bridge, but once there we looked at each other and decided to keep going for Rosthwaite, which by then was only 20 minutes away. 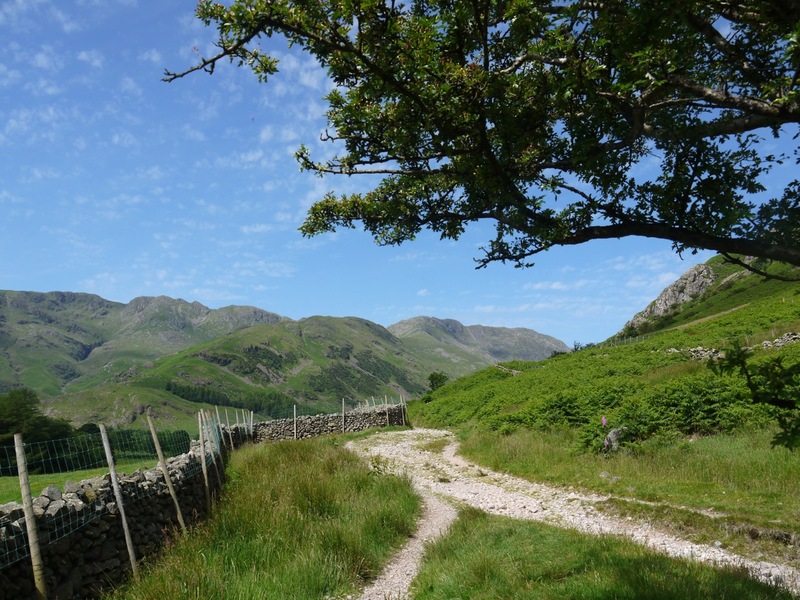 At Rosthwaite we headed straight for the pub and a well deserved ice-cold drink. Due to a misunderstanding we missed the bus, but that gave us an excuse to have a second drink. A short journey on the 78 bus returned us to Keswick and the car. 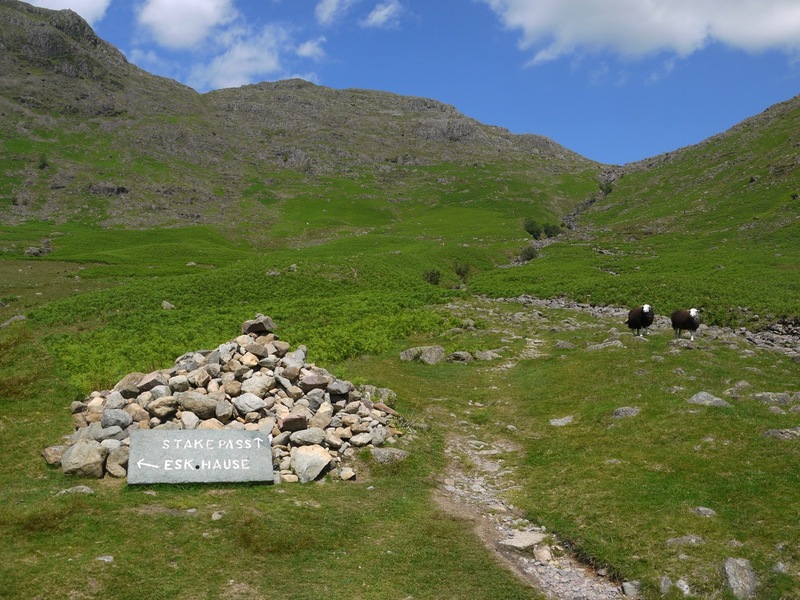 This entry was posted in Cumbria, Lake District and tagged Cumbria Way. Bookmark the permalink.